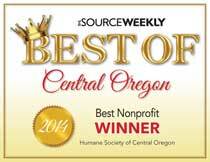 The Humane Society of Central Oregon has an animal shelter and a thrift store. Come in and take a look at our latest treasures. Your donations help keep the shelter running. What is 20 minus 3 plus 5?